I love portabello mushrooms. They add a meaty, amazing flavor to so many recipes. Tasted a version of this the other day and wanted to try them ourselves-so here’s my twist with some ideas for variations as well. We’re going to make these today! Mmmm…..
Heat oven to 400 degrees. 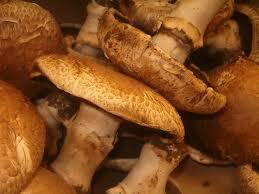 Remove stems and gills from mushrooms CAREFULLY – these guys are big but very delicate! Clean and chop the stems. Remove sausage from casing and crumble in large skillet – brown until no longer pink, add garlic powder, onion and mushroom stems and sauté for 2-3 minutes longer. Remove from heat. Add cheeses, panko crumbs, parsley and rice and mix well. Stuff mushroom caps gently and place on baking sheet. In the bottom of baking sheet add white wine. Bake 10-15 minutes until hot and bubbly. If you like, put the broiler on for 1-3 minutes just to crisp up the top – be careful – with all that cheese it will brown fast (so don’t do what I do and forget to watch it!). Serve with the marinara and a sprinkle of additional shaved parmesan. Can be a main dish or cut the recipe in half and serve as an appetizer! Variations: I may have to post these as separate recipes! Fill with crabcake mixture – brown according to the rest of the recipe. Want spicier – change out the sweet sausage for a med-hot variety or even a Andouille if you’re feeling a little Cajun – if you’re using any of the Cajun or Cuban sausages though – they tend to have more oil – so be sure to drain the sausage and remove oil before adding the cheeses and other ingredients. I’m thinking of ways to make a vegetarian variety – Hmmm…maybe black beans, onion, cilantro and tomato? What do you think? I’ll have to try it and let you know! Last year, right before embarking on our weeklong extravaganza 24 people together in a giant log cabin Family Reunion, my mom and I were in the local Target shopping for supplies when we came across this little baby. It was a Godsend when feeding the masses – but it’s been a wonderful addition to our kitchen. We cook in it at least 3-4 times a week. It keeps us from having to heat up the kitchen all the way, uses less energy than the stove and has an even heat that is REALLY important with some meals. Everything from french toast to scampi to just about anything you can imagine we make in this — and I just thought I’d share. I’ve since gotten several folks hooked on skillet cooking – now they travel with theirs too. We’re all so weird – but fun! This one is a Presto — there are many brands and variations of sizes. We like the big one – because there’s usually a few “strays” that stop by at meal time – and we love feeding a big crew. If you need any tips – leave a comment and I’ll give you my two-cents! My kids like a little extra kick to their alfredo – so here’s a spicier version of a classic alfredo. If you want it more simple – take out the chili powder and red pepper flakes. Put your pot of water on to boil – add splash of good olive oil and good dash of salt to the water. In a large skillet – heat olive oil and 1 tablespoon of butter. Season your chicken with chili powder, garlic powder and paprika – plus salt and pepper to taste. Sauté the chicken in hot skillet until brown on all sides and barely pink in the middle, roughly 5-7 minutes. 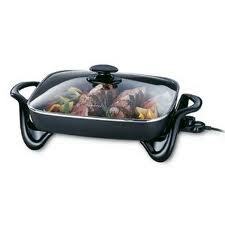 Reduce the heat to medium – Add the white wine to deglaze the pan. 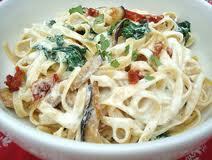 Reduce heat to low, then add your cream, sundried tomatoes and red pepper flakes and simmer to reduce cream by half. Next add in half the Parmesan and turn the skillet off. When your water is boiling – add your fettuccine and cook 8 minutes or until al dente. Drain your pasta – toss with the alfredo – and serve topped with additional Parmesan. If you like sprinkle with a little fresh chopped parsley or basil on top! Serve with loaf of Italian bread and side salad and you’ve got happy campers in your house. Want the quick and easy way to make this? – Cook your chicken as directed – add a jar of your favorite alfredo or lite alfredo sauce, plus the sun dried tomatoes and red pepper flakes – it’s just as good – but doesn’t take as long since you don’t have to reduce the cream. The whole thing can be done in under 15 minutes! Shrimp instead of chicken! Reduce cooking time slightly as the shrimp will cook faster – use 1 lb of shelled, de-veined, cleaned shrimp. Toss in 3/4 cup of frozen petite peas just before draining the water – just enough to make them warmed through and bright green! Got a cup of cooked broccoli to use up? Or even frozen florets — give them a quick blast in the microwave to warm through and toss in at the end. Try different pastas – this is great with penne, tortellini, bow ties…get creative!